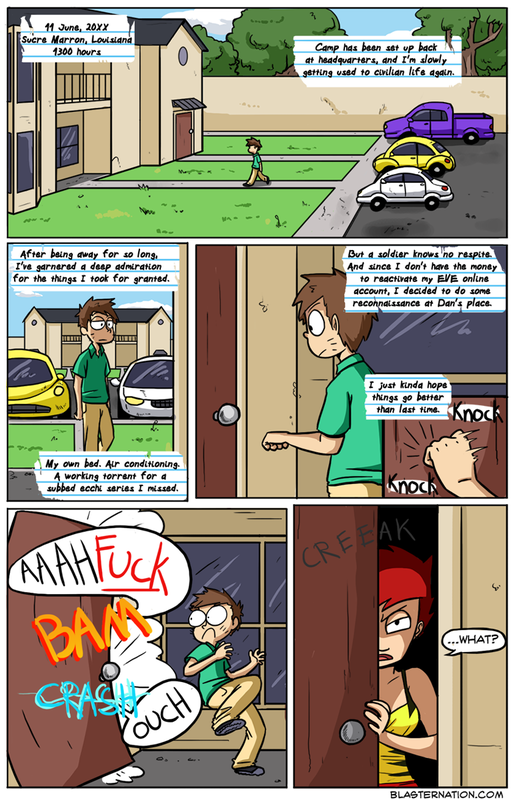 Blaster Nation - 24) Welcome Back, Matthew Palmer! 24) Welcome Back, Matthew Palmer! Our guest comics were great, and thanks to all of you guys who submitted them, you guys are awesome. But now it’s back to business! I think I was going through slight withdrawal, not being able to post our own updates, but that’s over now. Here’s to the start of a brand new chapter that I think you guys are really going to love. Hell, even Matt’s back! Throughout all of last chapter, I had so many people saying that they missed Matt. Which was funny, because the very first chapter also had a lot of people saying that Matt was too whiny. Maybe he grew on them or something, I dunno. Also, updated the banner to clarify our new update schedule! I think this whole twice-a-week thing is going to go pretty well. All in all, I’m pretty hopeful for just about everything we’re doing right now. Got any suggestions or comments or anything? Feel free to shove us in a particular direction you think we should be shoved! Post a comment, send an email, whatevah. We’re been trying to maintain more activity on Tumblr and Twitter. Facebook, not so much, but we’re still on it. And as always, we’re taking commissions from here to the end of time until we simply transcend material needs.